Specially developed to gently cleanse young skin with blemishes, EXFOLIAC® Foaming gel helps eliminate impurities, regulates sebum secretion and respects the skin's pH. It reduces the proliferation of bacteria and ensures the epidermis is cleansed durably.Thanks to its daily action, the skin is clearer and pores are tightened for a glowing complexion..
A AHA based product, Exfoliac Foaming Gel has been formulated to cleanse the oily, blemish skins. 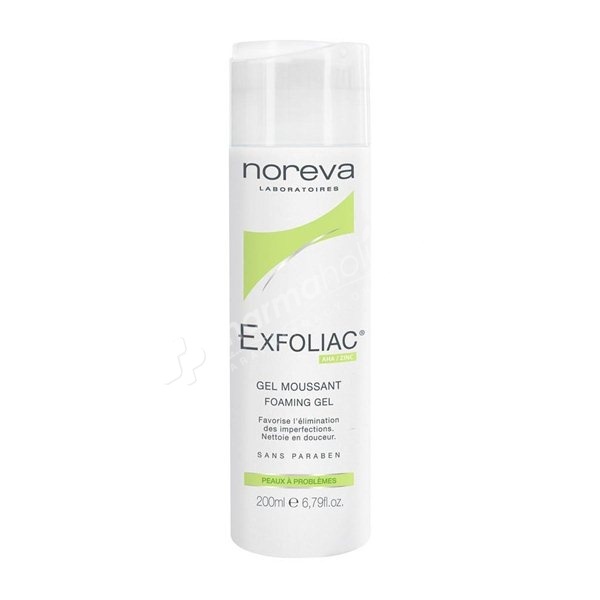 It purifies your skin and eliminates all the impurities. AHA work on the functions of the epidermis cells, and clear up. Zinc lactate regulates the production of sebum. It respects the epidermis balance and is also suitable for weakened skins caused by irritating treatments. Purified, your skin is soft and clear. Take a knob of gel into your hands and work into a alther directly to damp dace. Insist on spots and other blemishes (T-zone, forehead nose and chin). Rinse thoroughly with tepid water and dry without rubbing. Aqua, Sodium Laureth Sulfate, Decyl Glucoside, Cocamidopropyl Hydroxysultaine, Ammonium Lactate, PEG-7 Glyceryl Cocoate, Triethanolamine, Acrylate/Steareth-20 Methacrylate Copolymer, Zinc Lactate, Tetrasodium EDTA, PEG-120 Methyl Glucose Dioleate, CI 42090, Sodium Hydroxymethylglycinate, Parfum (Fragrance), Hexyl Cinnamal, Butylphenyl Methylpropional, Linalool, Benzyl Salicylate, Benzyl Alcohol. Active Ingredients: Alpha-HydroxyAcides (AHA), Lactate de zinc, Agent relipidant, Agents lavants extra-doux.